Ganesh Anandan is an Indian percussionist active in musical fields ranging from traditional Carnatic to contemporary improvised music. He studied the kural (bamboo flute) and the mridangam (trad. percussion instrument) in his native city of Bangalore, India, before moving 1976 to Canada, where he studied piano and western percussion and began his prolific musical career. 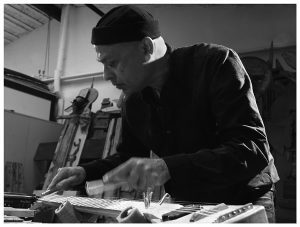 As an experimental luthier Ganesh started building Percussion Shruti Instruments in 1995 based on the Indian 22 interval octave. He built the electric 6 and 12 string shruti stick, which he usually prepares to obtain a wider sonic palette of tonal and percussive sounds and developed unique personal playing techniques including transposed Carnatic finger drumming style on these instruments. Ganesh performed on the Procrustean Bed series with “uproot”.